Kentucky officials are trying to figure it all out. Should the state’s top public health officials push for a ban on the vaping industry? Or should they lobby the state government to raise the legal age to 21 from 18? Maybe they should focus on advertising tactics? The Foundation for a Healthy Kentucky and Kentucky Youth Advocates staged at a conference in Louisville, Ken., recently and formulated a few recommendations on halting teen smoking for the 2019 General Assembly to review, according to medicalxpress.com. + E-cigarettes should be included on all smoke-free ordinances and tobacco-free restrictions at schools. Currently, fewer than half (52) of the state’s school districts have vaping part of their policies, medicalxpress.com reported. + An enhanced e-cigarette state tax should be initiated to mirror the tobacco tax on combustible cigarettes. + A series of targeted flavored e-liquids, which tend to attract minors, should be banned from retail stores. + Providing more power to local law enforcement entities to better control the sale of e-cigarettes and traditional cigarettes, including an elevation of legal age to execute a purchase. Ben Chandler, president and CEO of the Foundation for a Healthy Kentucky, summed up the group’s feelings and work at the conference. Chandler pointed to a chilling presence of chemicals and metals the body absorbs during a vape. Vaping can lead to long-term lung trouble. “The gateway effect means kids who use e-cigs today are significantly increasing their risk for cancer, heart disease, stroke, oral disease and tooth loss, and all the other smoking-related health issues later on,” Chandler said. With those concerns, Chandler is leading the charge to help Kentucky health officials figure everything out. 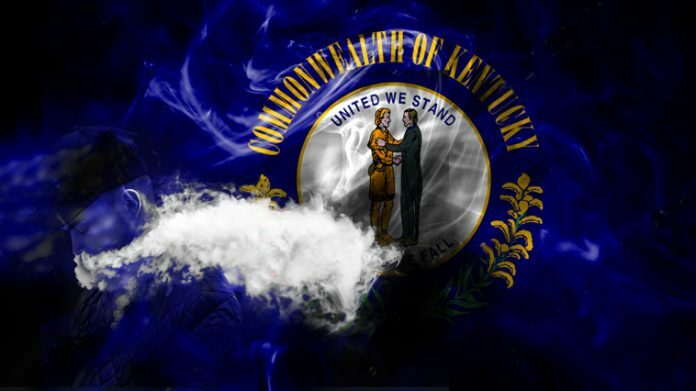 Keep up with the latest news, like this proposed Kentucky vaping legislation by checking out our Vape News page!